Another Hypoxia Event – Or Worse? Another plane down. This time 150 people are dead, 144 passengers and six crew on board flight 4U 9525 from Barcelona to Duesseldorf. An Airbus A320 operated by GermanWings – a subsidiary of Lufthansa flew straight into the Alps. The crash looks like a CFIT or Controlled Flight Into Terrain incident. The Cockpit Voice Recorder has been found and the recording will be analysed. Some say the recording will be normal until a deafening crash – because the windshield caved in. Before rampant speculation grows, lets look at a few puzzling facts. Firstly, why did the pilots not communicate in any way when there was obviously something going wrong? The plane reached its cruising altitude of 38 000 feet and a minute later began descending. Quickly but not in a death spiral. It also maintained speed over the next 8 minutes indicating more than likely that the autopilot was engaged. Secondly, what triggered its descent? Some are suggesting fire that quickly overcame the pilots, others hypoxia. That the compression system failed and then the pilots somehow were unaware. There is an alarm that sounds when the compression drops – and the standard procedure ensures that the pilot and first officer don oxygen masks, and ensure that their comms are working. Here is a graph of what’s known as “useful consciousness” at various altitudes. Note the useful consciousness after rapid decompression is about 15 seconds at 38 000 feet. A fire? Then if it was so bad that the pilots couldn’t say anything, then its unlikely the plane would have continued for 8 minutes. One of the truly terrifying comments was made overnight by one pilot flying the same plane, who has suggested the windshield collapsing scenario. That would have probably killed both pilots outright – or at least left them immediately critically injured. The 700kph wind blast at -56 degrees isn’t something you’ll survive. Maybe one managed to get a hand to the autopilot and select “descend” by feel, then passed out. The first thing pilots do is grab their oxygen masks. But a windscreen smashing itself to bits against you and the cockpit means damage to pipes and masks. Or as the British Airways BAC111 incident showed, a windshield failure saw the shield blowing OUT and the Captain was sucked half out the the front. The F/O managed to grab the Captain who’s feet had snagged on the control panel. In that incident the F/O flew the plane with oxygen mask on to land at the nearest airfield and the Captain survived. After 7 of the eight minutes the plane would have dipped below 10 000 feet when the ground proximity warning would have triggered as approached the Alps. It seems none of the crew were in any condition to react. Have a look at the graphic alongside. 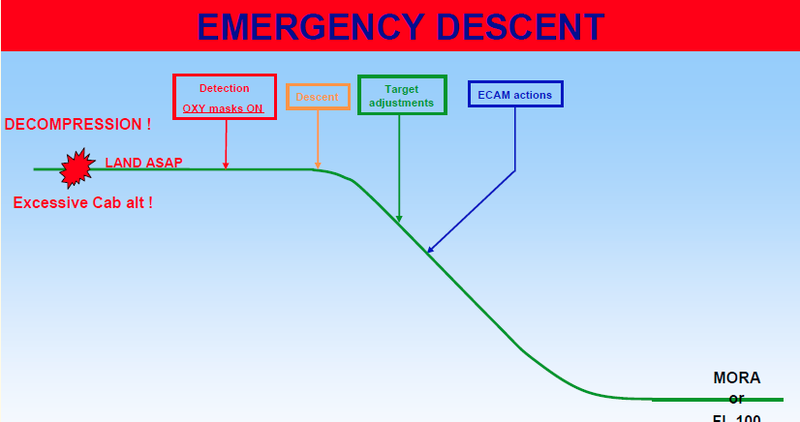 5) Check ECAM options (Electronic Centralised Aircraft Monitor) – which displays data concerning aircraft systems and failures. Pilots know the golden rule. You can fly without oxygen between 10 000 and 12 000 feet, but only for less than two hours. The safe altitude is below 10 000 feet. So in this case the glaring omission is the communication. This blog is called Aviate Navigate Communicate for a reason. The first thing you’re taught to do is fly the bird. The second is navigate and the third is communicate. So maybe they were so busy doing the first and second, they couldn’t do the third. Another possible scenario is someone entered the flight deck and incapacitated the crew. However, no-one has claimed responsibility for bringing down this plane. So its looking like a major explosive decompression which damaged the aircraft and communication equipment – and the pilots. This entry was posted in Uncategorized and tagged 4U 952, Airbus A320, Controlled Flight Into Terrain, GermanWings by desmondlatham. Bookmark the permalink.